If you are looking for cheap DIY wall decor with a pop of color, you'll love this EASY button art! I created it using a dollar store frame. When I say this is the EASIEST DIY wall decor project you'll ever try – I mean it! 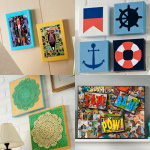 I love kitschy little home decor items/wall hangings, because a little color goes a long way to spice up a room. ESPECIALLY when you live in an apartment (hello Mod Podge Command Central) and you can't paint the walls. I have a love affair with buttons; I would marry them if I could. I decided to spice up a boring wall in my room with this cute little button art piece, incorporating my very favorite buttons and, of course, Mod Podge. Here's how to make my simple DIY wall decor. You are going to laugh, but I actually had this frame, spray painted Robin's Blue, in my craft stash. I don't remember when I spray painted it nor do I know where the back went. I do know that I got the frame from Dollar Tree and that it was black.When you get your frame, you can spray paint it like I did or paint it with acrylic paint (color of your choice). 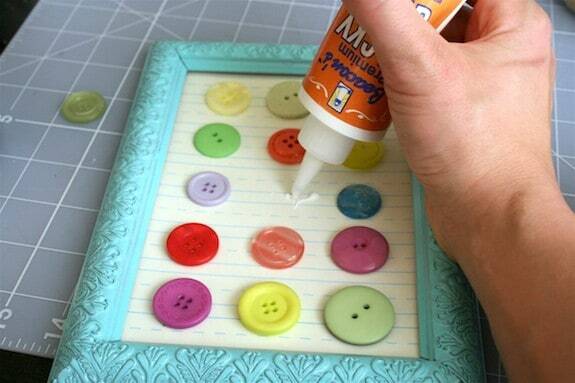 You'll want to seal it with Mod Podge though, because spray paint will chip off of cheap frames. Whatever you do, start with a frame. Because I lost the back of my frame, I had to cut a frame back from a spare piece of cardboard. This was SO easy. 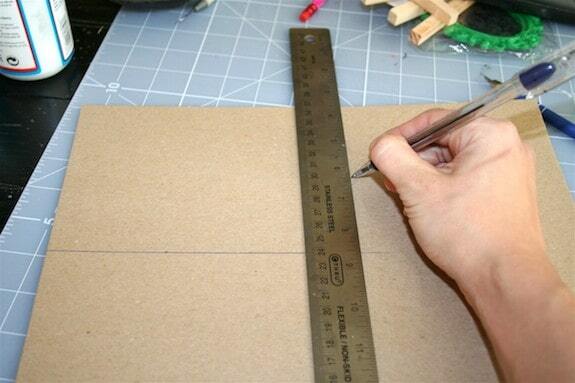 Just measure and cut with an X-Acto. If you are not absent minded and have your frame back, skip this step. 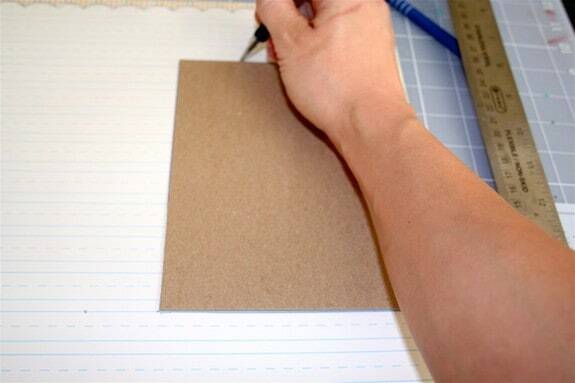 Lay your frame back down onto your sheet of scrapbook paper and trace. I actually had a Sassafras Lass sheet from the Nerdy Bird collection that looked like lined school paper. I liked it. Cut it out with your craft knife. 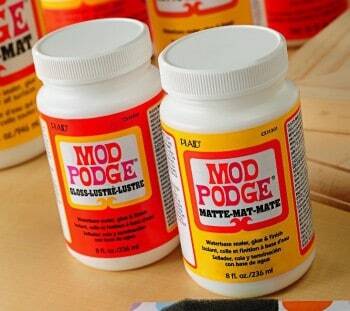 Use your flat paintbrush to paint a medium layer of Mod Podge onto your frame back. Coat thoroughly. 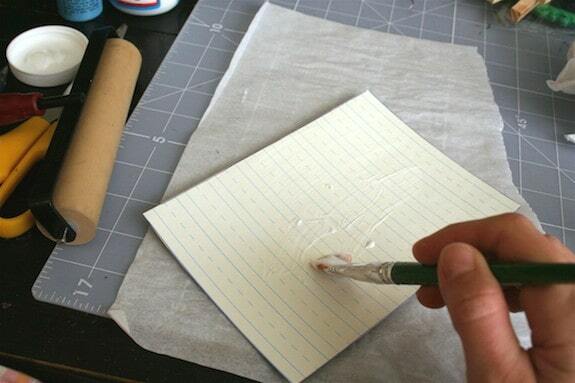 Quickly place down your scrapbook paper and SMOOTH. Keep smoothing until all of the bubbles are removed. You can use your hands – you see that I am using a brayer. Love this tool; great investment if you don't have one! Allow to dry for 15 – 20 minutes. 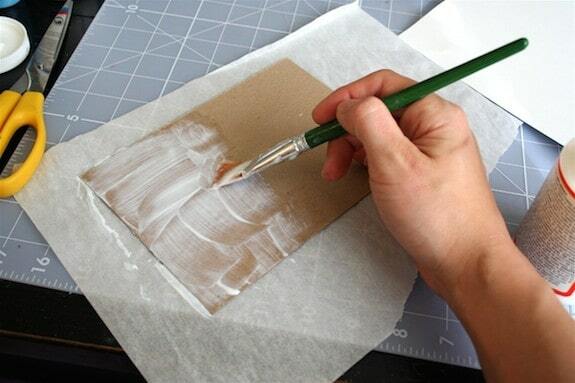 Once the paper is dry, paint over the top with Mod Podge. Apply a medium coat and allow to dry again. 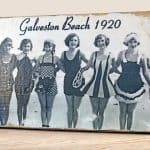 Place the back into the frame – you are almost done! Now you just have to glue down the buttons. I picked 15 buttons from my stash and laid them out before I glued them down (spaced them how I wanted them). Need a lead on some cool buttons? Go here for some great selection and deals. Let your button art dry about 24 hours before you hang. 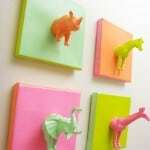 Isn't this DIY wall art easy? Make two or three for a cute little button art series on your wall. If you are ready to take your DIY wall decor to the next level, check out this button tree canvas from my friend Amanda! 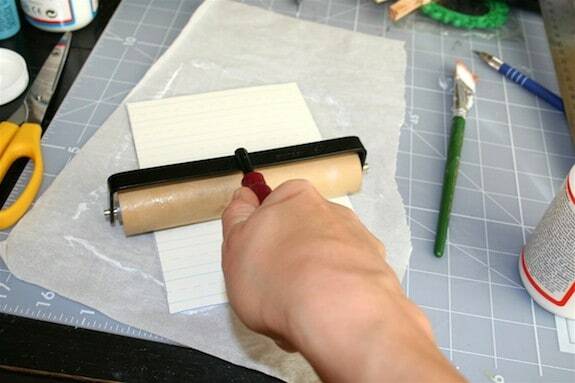 A brayer??? Ah haa. I did a little project today in which a brayer would have come in handy. I will add it to my shopping list. Thanks! By the way, this is my first time here & I’m glad I found you! Amy! 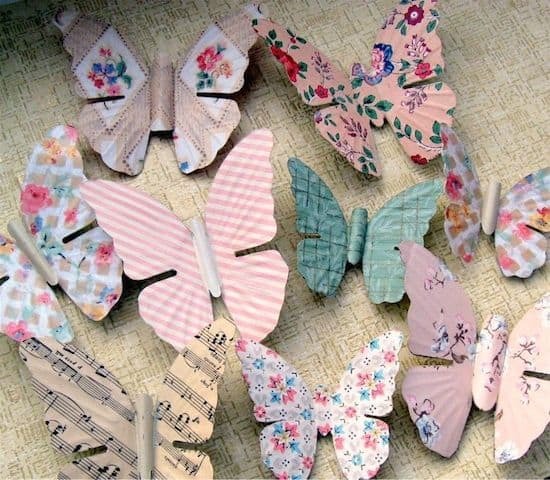 This is such a fun project for my little girl’s room. Love buttons…love this! I’ll be featuring! So simple and so sweet! I love it!! Love it! I am so making this one! 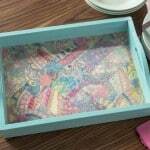 Oh Amy Amy Amy…this has got to be one of my favorite decoupage projects yet. I love it. I have so many buttons if I placed them end to end they would….probably fit the length of California…no kidding. I love buttons and they are everywhere! hahahaha…this is so great I can’t wait to try this. Yipeee. Oh! I love it! SO cute! This is going on my blog! Woo! That’s so cute! I love the lined paper you used for the background. Really, who COULDN’T use one of these? Thanks – so inspiring! Love this one the most! I love buttons too, Good idea, Amy. I love this! Very kitshy! 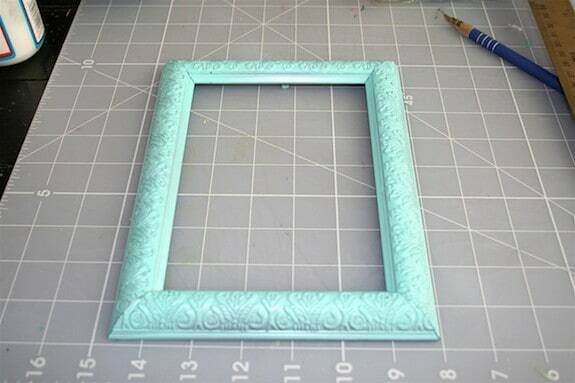 Every Tuesday, I host a Turquoise Tuesday party and since this frame is turquoise, you might want to link up. I love this so much! Darling. Very, very cute! Simple! Charming! Eye-catching! Adorable! Fun! And I just love it! You have made ME want to collect cool buttons! That is too cute! Love all those colors! That is so cute! Thanks so much for the great idea, I’ll be linking. This gives new meaning to the phrase “cute as a button!” I love it! I love this–So cute! Definitely on my to-do list. Thanks! How cute! I love buttons. Will have to do this soon! I’ll link this to my blog,thanks! This is such a lovely idea! (And the colors are gorgeous.) I’m gonna put your link on our MOPS message board for craft leaders. Thanks for sharing! Very cute! I love this and I love your blog. Very cute, a great way to display favorite buttons that you can’t bear to use…yet. So freaking cute! Love it – tfs! This is perfect! My friend has a 3yo daughter who is moving into a “big girl room”. When asked how she wanted her room to look, she said she wanted BUTTONS all over. Thanks for a great project! Such a fun way to display buttons!! ave started getting materials together. Soooooooooooo neat! !